Hi there! It’s a new month (Can you believe it’s October already? 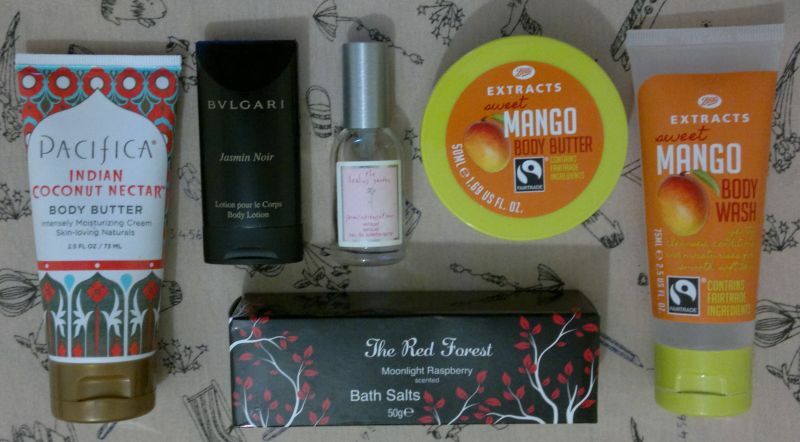 ), so let’s look at the products I used up last month! As always, I’ve used several face masks (Yay!) which means I’m getting on top of my stash – and I can buy new face masks later this fall – although not this month. But now, let’s look at what else I’ve used up in September. 1 Original Source Tropical Pineapple Shower – a decent shower gel that smells like the white Haribo gummy bears. I’ve used it on and off for over a month. I do have a back-up bottle but once that one’s finished too, I wouldn’t repurchase it. 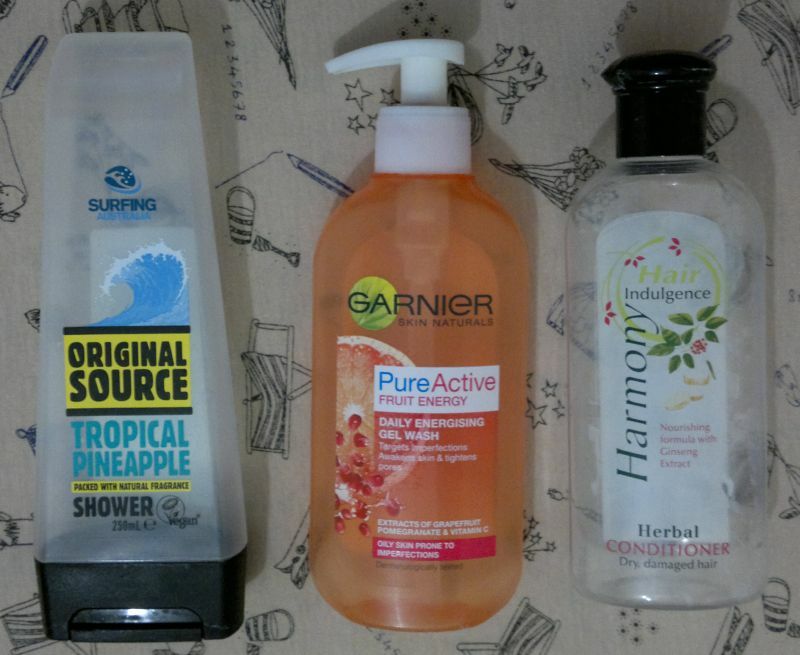 2 Garnier Pure Active Fruit Energy Daily Energising Gel Wash – a decent face wash which I’ve been using on an off for about a year. I don’t think I’d repurchase it. Whilst it was nice while it lasted, it’s simply not a favourite. 3 Harmony Hair Indulgence Herbal Conditioner With Ginseng Extract – a good conditioner that detangled my hair without problems. Of all the Harmony conditioners this is the best one. In addition, this conditioner smells amazing! I will buy it (and the shampoo) again! If you’re wondering what happened to the shampoo, I’ve passed it on to my husband who always uses up my shampoos once I’ve emptied the matching conditioners. 4 Garnier Ultimate Blends The Shine Revitaliser Conditioner – I’m pretty sure this is the best Garnier conditioner I’ve ever had. The Garnier shampoos and conditioners I’ve tried in the past made my hair go greasy within about 12 hours after washing, but this one didn’t. I was also pleased with how nicely this conditioner detangled my hair. And whilst the fragrance isn’t my favourite (it’s not bad, but it’s just OK), I’ll buy this shampoo and conditioner combo again. 6 Olay Essentials Smoothing Face Scrub – a very nice, gentle and creamy (!) face scrub that’s perfectly suitable for dry and sensitive skin. This product lasted me for over a year! This scrub has been discontinued, so I can’t repurchase it, but I have two back-up bottles! 7 Pacifica Indian Coconut Nectar Body Butter (73ml travel size) – this is one of the few Pacifica products I didn’t like at all (the smell is very unpleasant). But since I always try not to be wasteful, I used this product as a foot cream. It did an OK job, but compared to other body butters I’ve tried, this one is considerably less moisturising. And it’s actually not even a body butter, but more of a lotion. 8 Bvlgari Jasmin Noir Body Lotion (30ml travel size) – a decent body lotion. Ages ago. I got it as a sample to figure out whether to buy the fragrance. 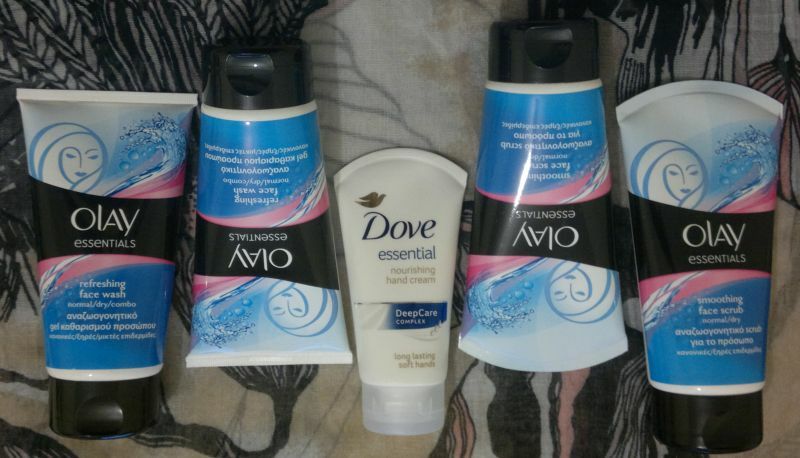 I’ve used up the body lotion now, and I can safely say it made me fall out of love with the fragrance. 9 The Healing Garden JasmineSensations (15ml) – the sweetest and most delightful jasmine fragrance I’ve ever come across. It’s all sweet, innocent jasmine and bubble gum. It’s delicious. The bottle was near empty (5ml left?) when I started to use it again this month. Ages ago, I found this fragrance at one of those bargain basement stores (I think the store name might actually be Bargain Basement or something like that), and I’ve never seen it anywhere else before or after, so I assume I’ll never be able to buy it again. BUT I have several back-up bottles! 10 Boots Extracts Mango Body Butter (50ml travel size) – the best and most delicious mango body butter out there. Forget the more expensive one from you know where. 😉 Get this one from Boots. It mops the floor with its competitors. I will, without doubt, repurchase it. 11 Boots Extracts Mango Shower Gel (75ml travel size) – it smells just as amazing as the body butter, it lathers up nicely, and it’s not drying at all. Yes, I’ll repurchase it. 12 The Red Forest Moonlight Raspberry Bath Salts (50g, single use) – Ages ago, I got these bath salts as part of a small limited edition gift set from the 99p Store (R.I.P. 99p Stores!). I think these bath salts are actually decent. And the rose & raspberry fragrance is pleasant. 13 Dolly’s Mixtures Piña Colada ‘Don’t Be Shy’ Shower Gel – a decent shower gel that smells mainly of pineapple with a hint of coconut. I do like it, but it’s not a favourite, so I don’t know if I’ll repurchase it. 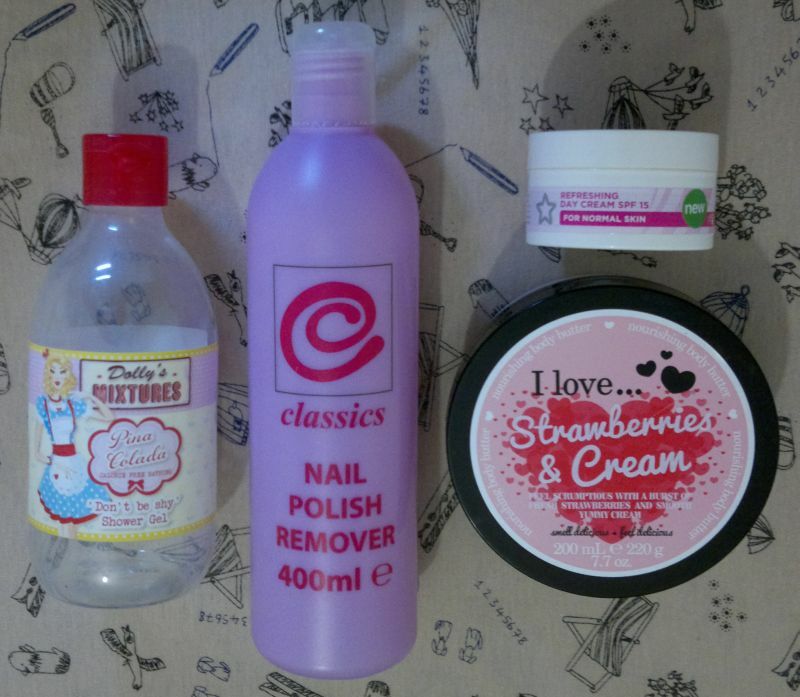 14 Classics Nail Polish Remover – my favourite nail polish remover. Not tested on animals, made in the EU. What’s not to love? For as long as this nail polish remover is made, I’ll keep buying it. 15 Superdrug Refreshing Day Cream SPF 15 For Normal Skin – a decent SPF face cream that moisturises well. However, I’m not in love with the fragrance (the next person might love it), so I won’t repurchase this cream. Saying this, if you’re on a budget and if you’re looking for a nice moisturiser with SPF, I would definitely recommend it. 16 I Love… Strawberries & Cream Body Butter – if you love strawberry-scented toiletries, I’d definitely recommend this one because I Love…’s Strawberries & Cream collection is the most natural smelling strawberry-scented product line out there. Personally, I found the fragrance overwhelming, so I used this body butter as a foot butter – with great results. But I wouldn’t repurchase the product. So this is it for this month! I finished several travel-sized products, I managed to finish a face cream and I emptied a seemingly bottomless face wash. Success! What have you used up this month? Have you used any of the products I used? If so, please let me know in the comments. 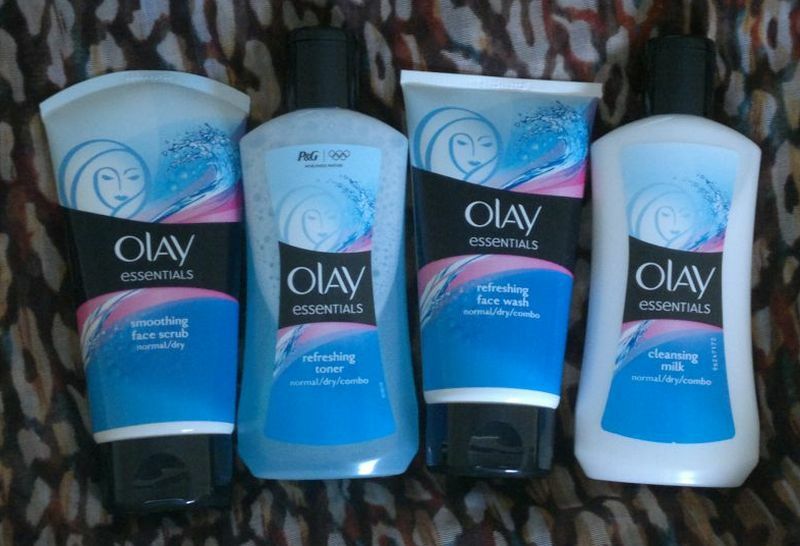 My first post is about my favourite face cleansing products – Olay Essentials. 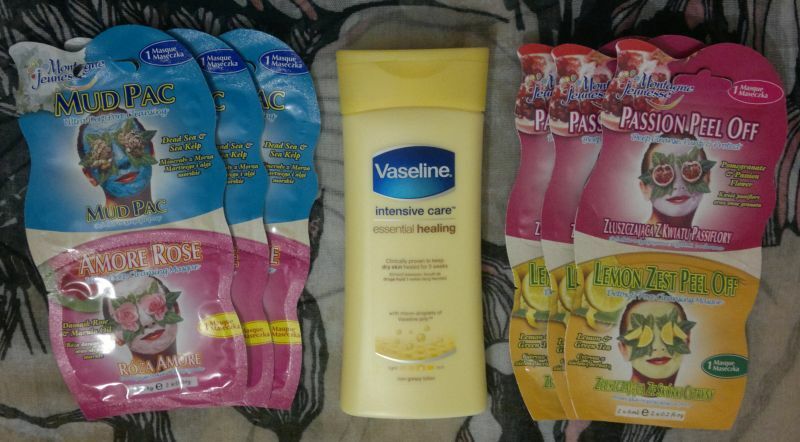 From left to right: Olay Essentials Smoothing Face Scrub, Olay Essentials Refreshing Toner, Olay Essentials Refreshing Face Wash and Olay Essentials Cleansing Milk. *they smell nice and clean. Olay Essentials Smoothing Face Scrub is one of my favourites. This face scrub is a gentle exfoliator, so it can be used daily. I have dry and sensitive skin and I’m really pleased with this product because it does not sting or burn and it doesn’t leave my skin feeling tight or dry. I use it 2 to 3 times a week in the shower and I really enjoy how soft and clean my skin feels after each use. 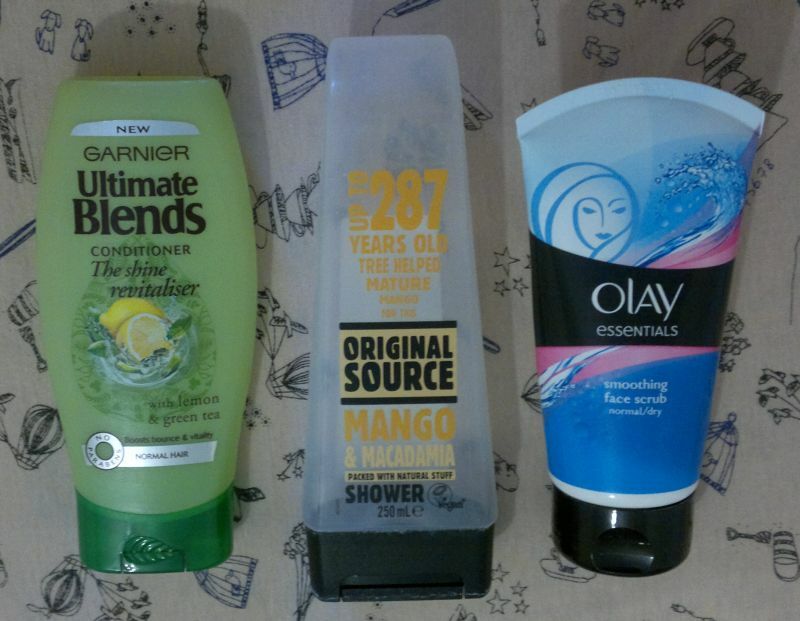 When I don’t use the face scrub, I cleanse my face with Olay Essentials Refreshing Face Wash in the shower. A pea-sized amount is enough to get rid of grease and grime – even around the nose. The face wash is really powerful, yet it feels gentle, refreshing and doesn’t cause redness or dry skin. This is my favourite face wash. Thumbs up! Olay Essentials Cleansing Milk is my go-to make-up remover when my skin needs a little extra care and attention. I massage the milky cleanser into my skin to dissolve make-up before washing it off. This cleansing milk moisturises the skin whilst it’s being applied, thus preventing redness or irritation. A real super star product that doesn’t aggrevate dry or sensitive skin. Whatever cleanser I use, I usually give my face a quick wipe with Olay Essentials Refreshing Toner before I apply my moisturiser. This toner is powerful in removing excess oils and all kinds of residue from make-up or cleansing products. However, this toner is also alcohol-free. This means that it’s rather gentle and, again, most suitable for dry or sensitive skin. If you have normal, dry or sensitive skin, Olay Essentials is the product range for you. In the past my skin has reacted pretty severely to a few other products, but I haven’t had any problems with these affordable cleansers at all. The face scrub and the face wash are available as 150ml, while the cleansing milk and the toner come in 200ml bottles. All these products are usually around £3, but there’s always some kind of special offer somewhere.